A dental crown completely covers a tooth above the gum line. This is in contrast to a dental veneer, which only covers a tooth's front surface and needs natural tooth structure to support it. Therefore, if a tooth is missing a significant amount of structure above the gum line, a crown would be the restoration of choice. 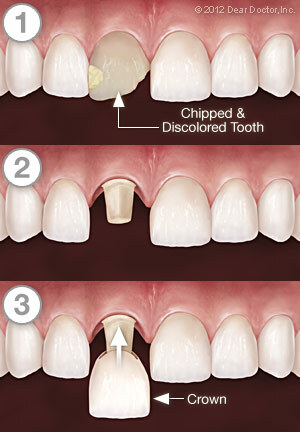 Dental crowns strengthen damaged teeth, allowing them to function normally again. When crafted from today's high-tech porcelains (dental ceramics), crowns are virtually indistinguishable from natural teeth. They can even be designed to improve upon a tooth's original appearance. Dental crowns can also be used to create a lifelike replacement for a missing tooth. This is done with bridgework, which spans the space of the missing tooth and requires at least three crowns. Two of those crowns will be placed over healthy teeth on either side of the missing tooth; these healthy teeth are referred to as abutment teeth. The two crowned abutment teeth become supports for a third crown placed in between them; that third crown is referred to as a pontic. 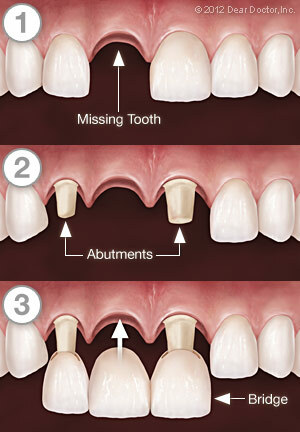 If more than one tooth is missing, more crowns will be needed to bridge the gap in between the abutment teeth. Dental crowns and bridgework require the same conscientious care as your natural teeth. Be sure to brush and floss between all of your teeth — restored and natural — every day to reduce the buildup of dental plaque. When you have crowns, it is even more important to maintain your regular schedule of cleanings at the dental office. Avoid using your teeth as tools (to open packages, for example). If you have a grinding habit, wearing a nightguard would be a good idea to protect your teeth and your investment. Call Advance Implant & Cosmetic Dentistry at (203) 576-1918 today!